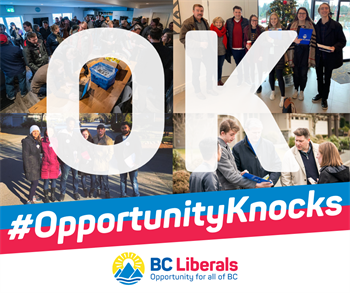 After very successful Opportunity Knocks canvassing events in Surrey-Guildford, North Vancouver-Lonsdale and Vancouver-Fraserview, we'll be hitting the doors in Vancouver-Point Grey to find out whether voters support our efforts to provide opportunity for all of BC. Join us for an afternoon of door-knocking on Saturday, May 4 at 2:00 PM in Vancouver-Point Grey – a riding that we lost by a very small margin in 2017 that we can win back. We will be joined by a very special guest - neighbouring MLA and BC Liberal Leader Andrew Wilkinson! Please feel free to invite friends or family members to join us. Register today to let us know we can count on you for May 4!